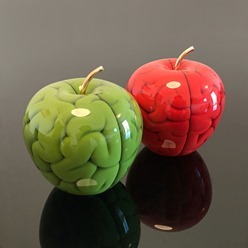 Emilio Garcia’s candy-colored Forbidden Brains will debut at the upcoming Swab Barcelona Art Fair (9.27 – 9.30) from 3 Punts Gallery. 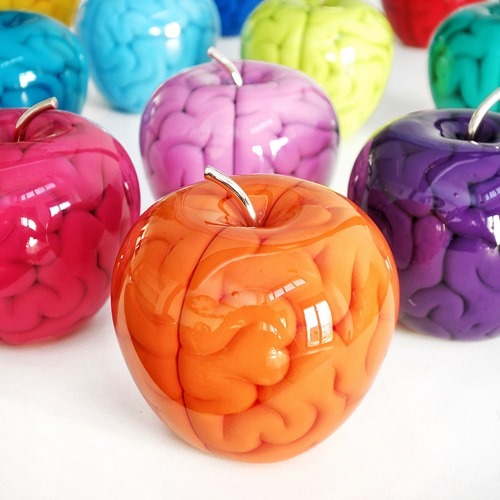 Featuring an ultra-clear apple an inner signature brain in eleven different colors, and a metallic stem, these are a feast for the eyes. Three AP editions of each color will be available for the contact. Contact 3 Punts Gallery for inquiries and to purchase. Emilio continues to create amazing, delightful objects in his signature motif. From collectibles to high-end art pieces, his brain knows no boundaries.